Website and processes: 30 Mar 16 Jan, 5/5 Excellent "Very easy to use website"
This is an ideal introduction to the world of light aviation. On arrival you will be warmly welcomed by your instructor and you will receive a short pre-flight (safety) briefing during which you can discuss the route you wish to fly. Obviously being a large airport there is some restricted airspace which need to be considered but outside this the choice is yours. Your instructor will walk you to the light aircraft and once you are safely strapped in you will be listening in on the headset and awaiting clearance from the tower to taxi. Once at a safe altitude the briefing will continue and you will be shown the basic principles of flight and how the controls work. You will then have the opportunity to take the controls and fly the aircraft. Too soon it will be time to hand back the controls and return to base. After the flight there will be chance to discuss any outstanding questions with your instructor. Tea/coffee and biscuits provided in a heated seated area in the building.. Signed certificate on completion. You will also recieve an information pack on Learning to Fly. Spectators welcome and may take photographs. They are unable to go airside but can observe from our side of the security fence. 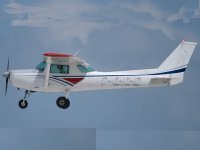 The person having the flying experience may take a camera/phone into the aircraft to take photographs of the experience. Please arrive 15 minutes before your allocated time. Persons flying need to bring with them a current passport or photo ID driving licemce. Maximum weight 15.5 stone (98kg) . Maximum height is 6' 6" (1.98 m).